Camp Linger, with its tagline “Do Nothing”, lives up to its advertisement. In a way, there is nothing to do but relax and enjoy the service that is provided. It is not much different from a resort. In fact, it is a resort with amenities that a backpacker might need and at a cost that a backpacker might be able to afford. 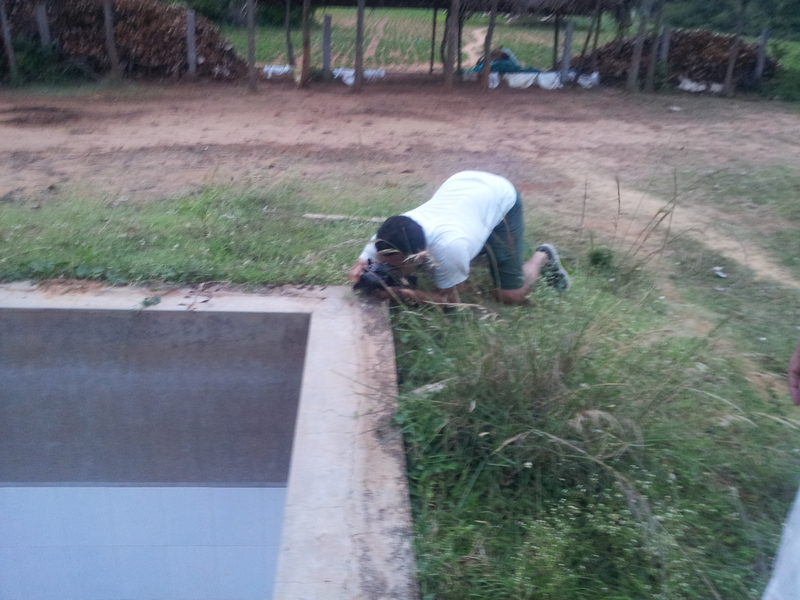 Last weekend, along with few of my batchmates, I visited this small farm [map] about 100 kms north-west of Bangalore. 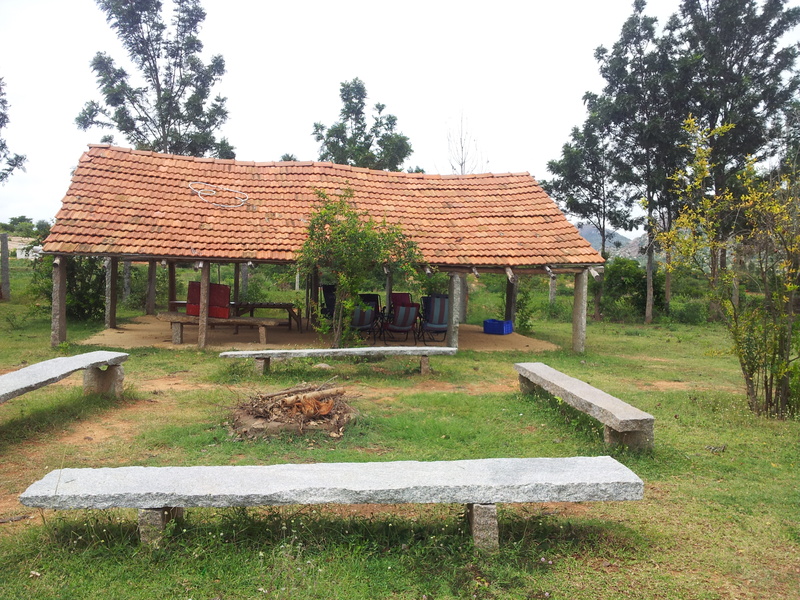 A typical “do nothing” hut. 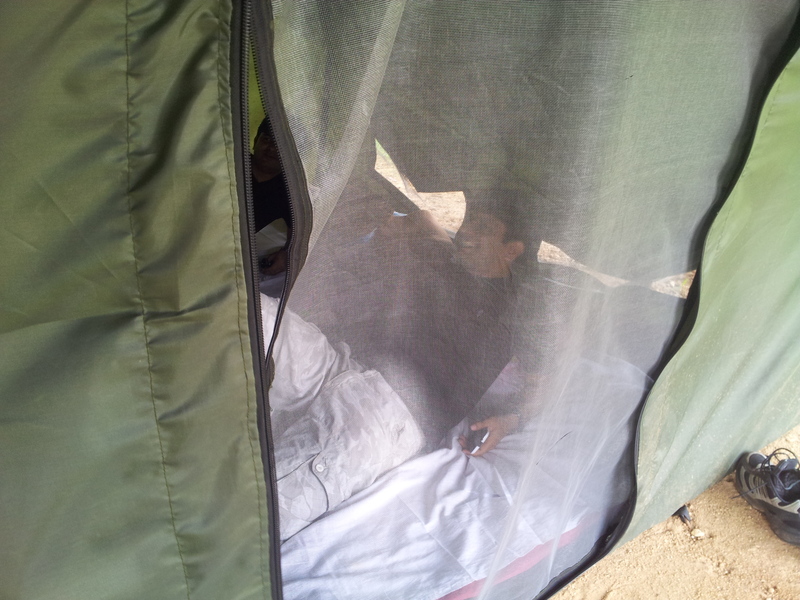 For the price, we were given accommodation in tents, at least six meals and general service. The part where we did nothing. The tents were standard Quechua tents that can house six people. These tents were housed under huts without walls. This was to purely emulate the surroundings of wilderness. In reality, we were far away from anything that can be remotely related to wilderness. The area, for its majority, is a farmland. We came across tilled lands with groundnut, maize and rice(?) plantation. A large Quechua tent for night accommodation. Our hosts were a Telugu family who did not know Hindi or English. We had a hard time communicating in broken Kannada. The breakfast was nice (not because we were hungry, but genuinely nice) and as a result we asked our host to make some North Indian stuff like rotis. It is not a wise idea to ask a Telugu village folk, with limited exposure to North Indian palette, to make something he had probably never tasted before. We paid the price. Barring the dal and sambhar, nothing else was remotely good to our tastes. For the rest of the duration of our stay, we stuck with safer options like dry chicken, scrambled eggs (it wasn’t what we were expecting but it wasn’t that bad), dal and sambhar. There were few misses with our evening snacks but overall, the decision to stick with safer options paid off. 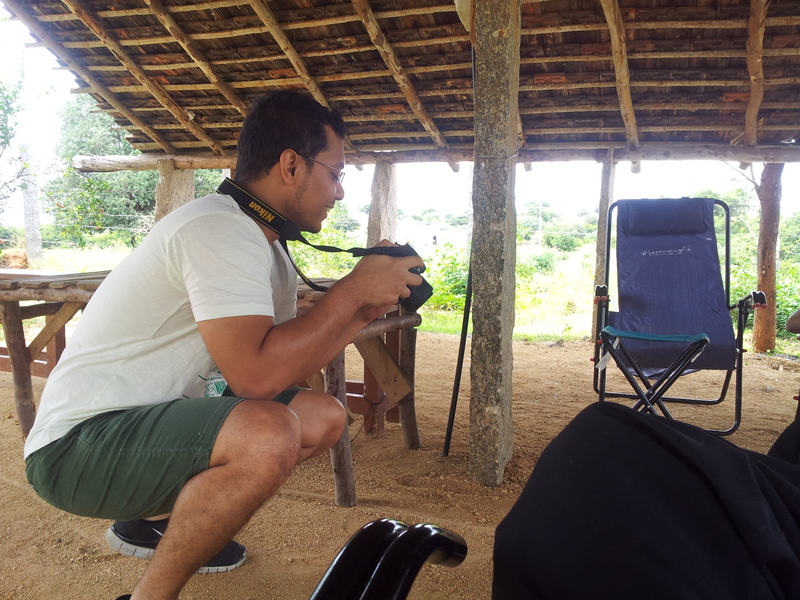 “Lazy-chairs” were kept in one of the huts. My stomach was filled pretty well. So I dropped to my lowest potential energy just like my friends. It was after a long time that I had some discussion that would remotely be considered intellectual (or some might call it the hipster syndrome). 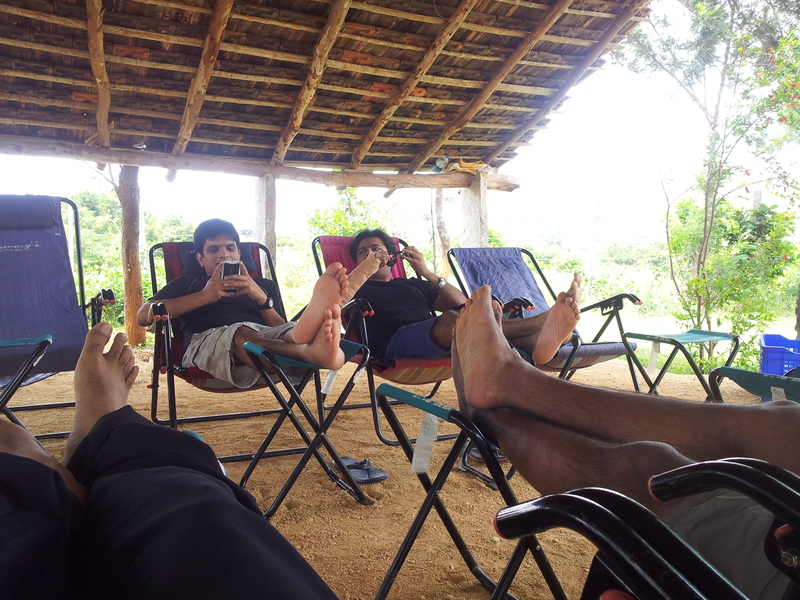 The “lazy chairs” and the lazy boys (Parth and Shashi). Meanwhile Nandy awakened the inner photographer in him and pulled out a DSLR, while Shashi forwarded me an article. The timing of the article couldn’t have been better. There are small mounds around the camp. We walked around in the evening and climbed the shorter trees. The red soil is often interrupted by uncultivable stone mounds. Come night and we enjoyed ourselves around a bonfire made by our host. There was booze and unlimited stream of 90s Bollywood music. Nothing could have been better. 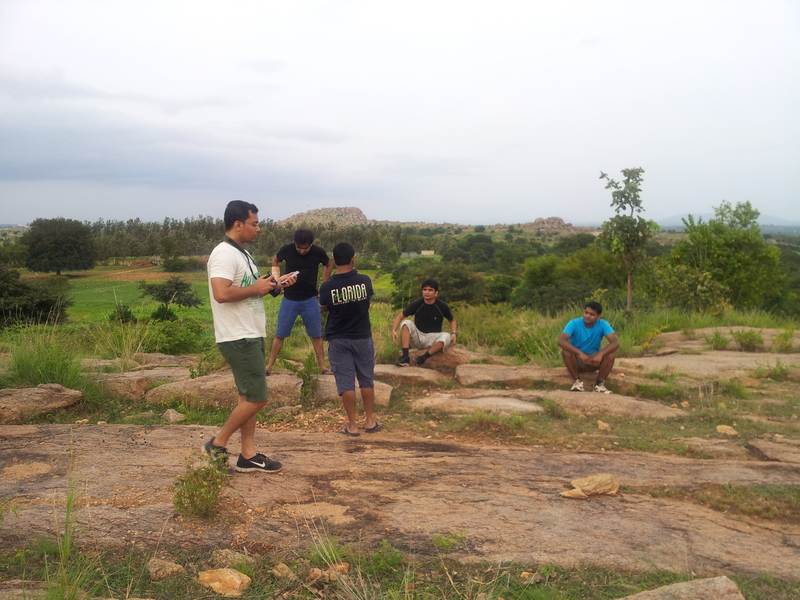 The part where we went for a trek. Our destination was the furthest hill. We were pretty much wasted the night before. Our host wanted us to go to a nearby temple atop a small mountain. We had our breakfast around 11 and left for the trek. Big mistake! Firstly, I had quite some amount of the veggie curry we were offered in the breakfast. It contained a lot of garam masala. 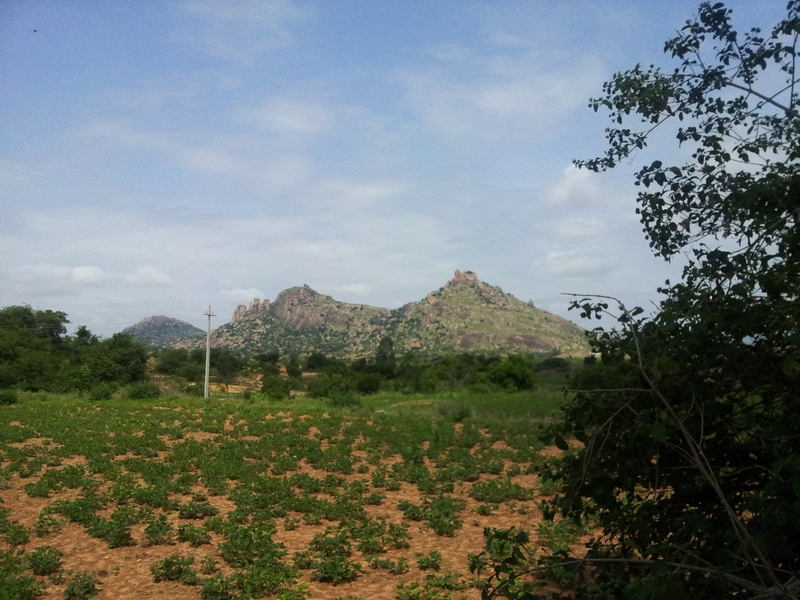 There was irritation in my throat even at the end of the trek. Secondly, the Sun shone too bright. It was discomforting to me. During the climb, Shashi lent me his pair of sunglasses. I have never used sunglasses before. It was so soothing then. For a few minutes, I did not have to squint my eyes. It was convincing enough to motivate me into buying a pair sometimes soon. Also, as I am writing this entry, I have a large, diffused mark on my neck from sunburn. Hanumanth, the caretaker’s son, was the most active person during the trek. Although I have lost some weight, I will have to work a lot on building my stamina. I was running out of breath at times. It could be because of dehydration but a bit more of stamina will be necessary for longer treks. While climbing I also scratched myself traversing through bushes. About an hour later, we were atop the mountain. There was a small puddle made by rainwater getting trapped inside a reservoir cut out on the top of the large monolith we had climbed. The cold water helped me cool down my skin quite a lot. The puddle atop the hill. 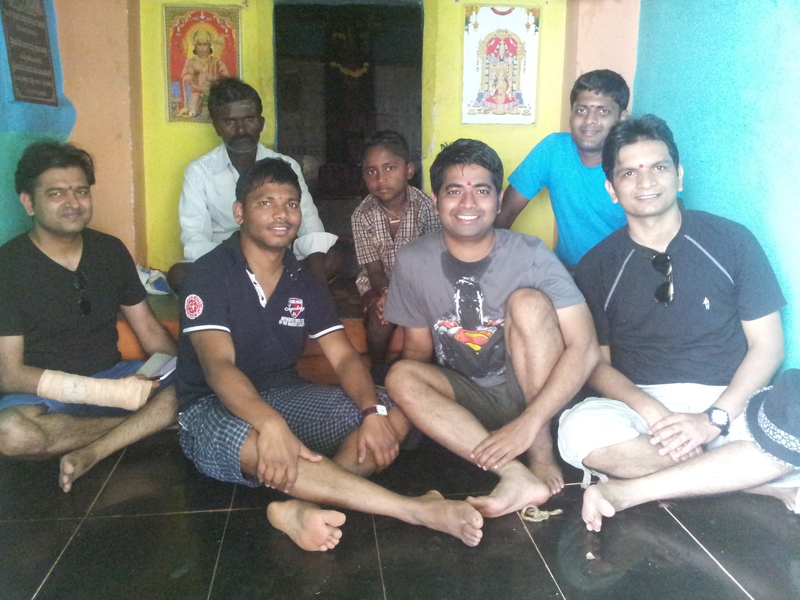 Our host had brought some flowers and incense sticks and performed a small puja in the temple adjacent to the puddle. Judging from the cheap, broken rum bottles around the temple, I was pretty sure that it was frequented by locals who sneaked away from their family to gulp down a quarter. There was a monkey who played around and worried us of our unguarded bags and shoes. You know how monkeys are. They don’t listen to human beings. The temple built with stone, cement and tiles. 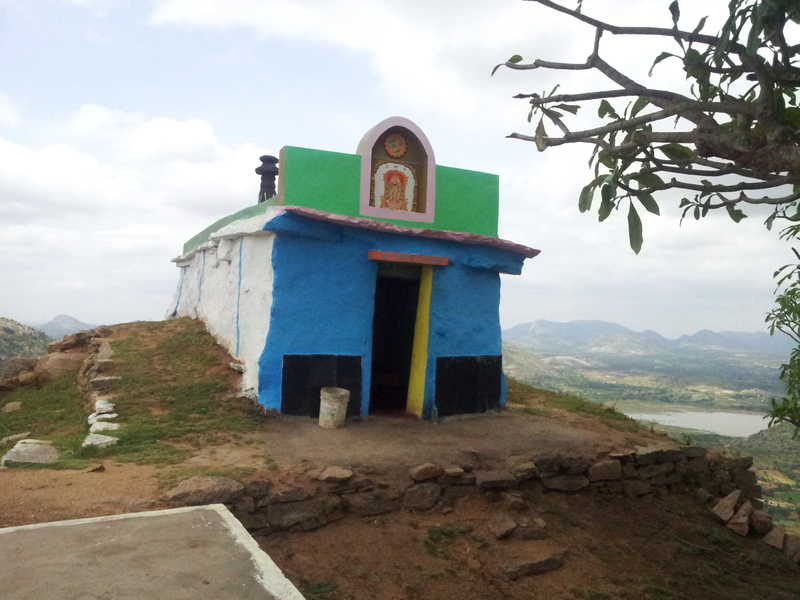 The villages around had gathered about INR 65,000 and two families had donated about INR 1,50,000 to build the temple. 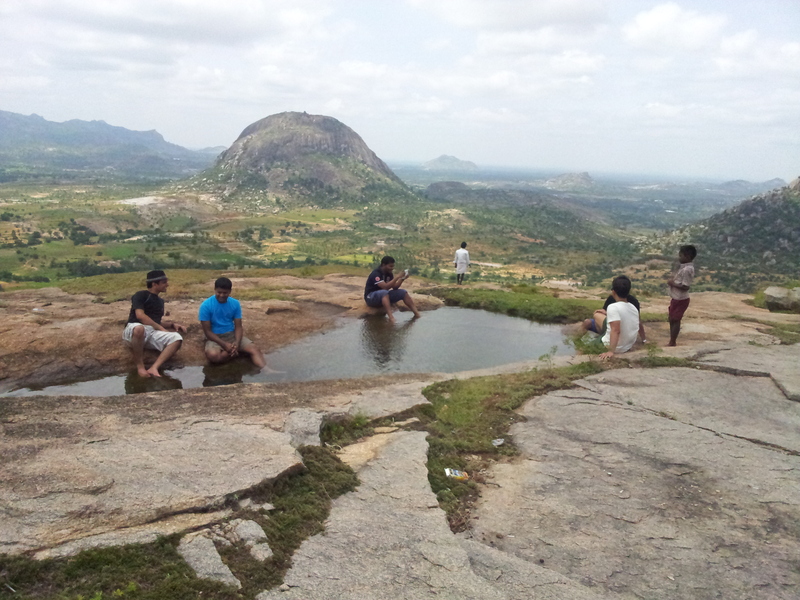 After clicking a few customary photographs inside the temple, we climbed down. I had some some good luck during the descent – the sky was cloudy. Us with the caretaker and his son.